In thousands of organizations of all sizes, Microsoft Exchange Server is the critical technology powering email, scheduling, contact and task management, and collaboration. To demonstrate their ability to implement and manage Microsoft Exchange in mission-critical environments, thousands of IT pros are seeking certification through Microsoft's MCTS exam 70-236 and/or MCITP exams 70-237 and 70-238. They need information they can absolutely trust: information that's simple and accessible enough for them to start using immediately. And many prefer to receive that information visually. That's where Microsoft Exchange Video Mentor comes in. 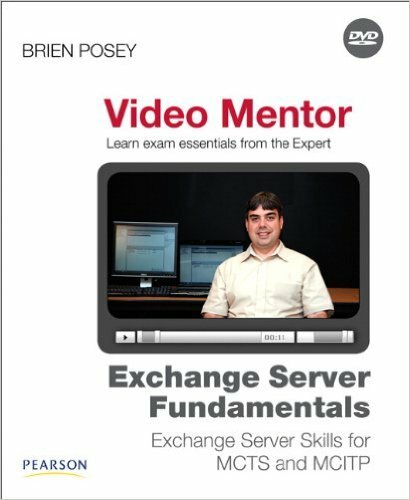 In 15 hours of personal, interactive DVD video mentoring, five-time Microsoft MVP Brien Posey walks you through all the Exchange tasks and concepts you'll need. Posey is singularly well-qualified to present this course: nobody brings more experience, passion, and excitement to Exchange Server. Here, he combines audio instruction, step-by-step screencasts, and more: everything you need to fully understand the tasks you're watching. There's never been a more efficient, cost-effective, compelling Exchange training solution.